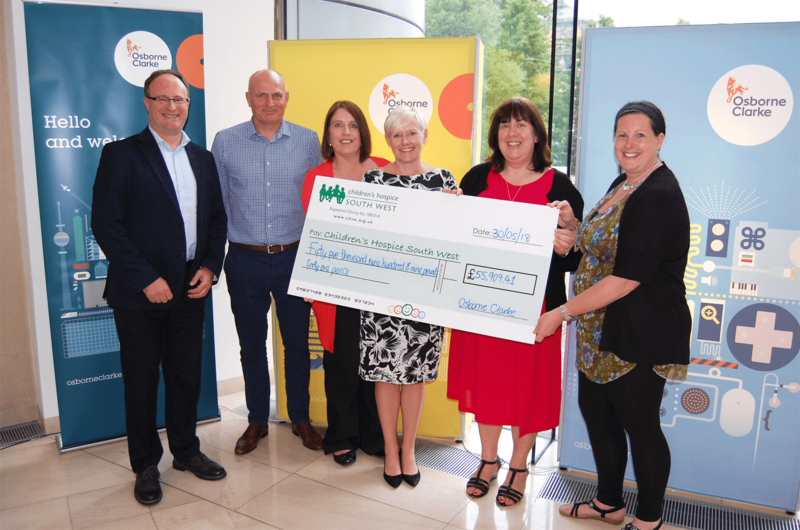 Since May 2016, the team at international legal practice Osborne Clarke's Bristol office has fully embraced its commitment to its chosen charity, Children’s Hospice South West (CHSW) in raising vital funds and awareness through a myriad of events. The two-year partnership has raised an incredible £55.9k for CHSW, whose local hospice (Charlton Farm) is based in Wraxall and provides specialist palliative care to children with life-limiting conditions, respite for the whole family, a sibling service for brothers and sisters, emergency support, end of life care and a bereavement service for as long as is needed. The Osborne Clarke team has undertaken a succession of challenges and fundraising activities, from bake sales (raising over £449 alone) and quiz nights (this year’s quiz raised £2,532! ), to dress down days, yoga & pilates classes. At the very beginning of the collaboration, 13 of the Osborne Clarke team raised over £3k taking part in the gruelling Three Peaks challenge. The team also took part in CHSW’s Rainbow Run – its annual colourful 5k fun run. Osborne Clarke people, their families and friends all got involved choosing to run, walk or skip around the course or volunteer on the Osborne Clarke sponsored orange paint station. Santa's on the Run, which takes places in Bristol at the beginning of December, was also brilliantly supported by Osborne Clarke staff, their friends and family. Dressed in their Santa suits, they all braved some pretty chilly, wet and snowy weather to complete this 2k festive fun run. A slightly more challenging run - Bristol Half Marathon - was the event of choice for some of the Osborne Clarke team. Calling themselves the ‘Bristol Half Challengers’ they successfully completed the 13-mile course and raised just under £4k.